The technique of printing on ceramic tiles was derived from the established practice of printing on paper. Consequently, images on eighteenth-century ceramics were often poached from published books. 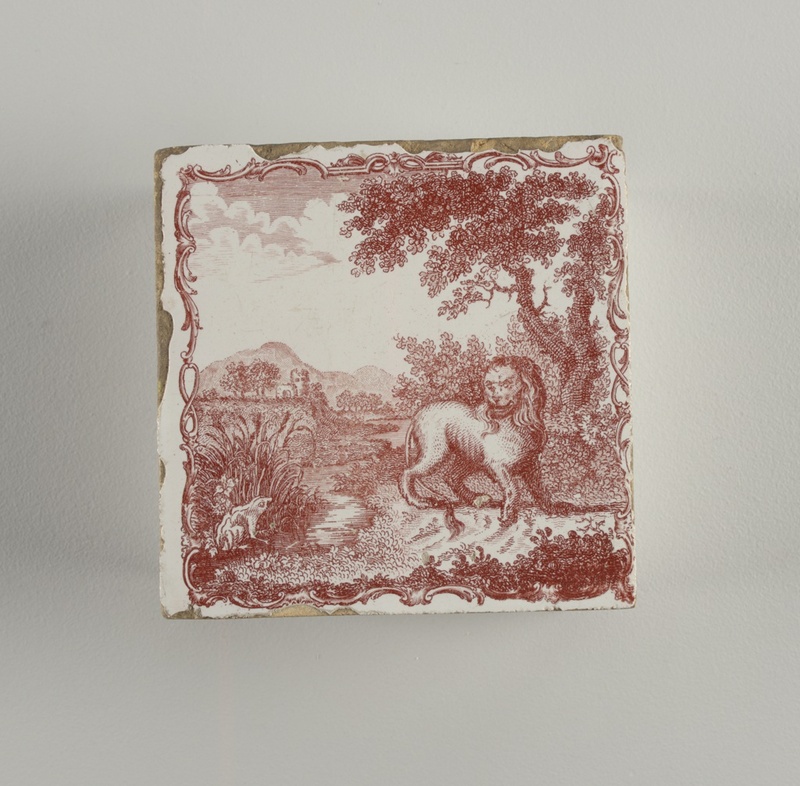 The image of the lion and the frog on this Cooper-Hewitt tile was copied after an engraving by Elisha Kirkall in Dr. Samuel Croxall’s Fables of Aesop and Others, first published in 1722 in London by Tonson and Watts. (fig. 1) During the late seventeenth and early eighteenth centuries, rising literacy rates contributed to an explosion of interest in ancient fables. In 1756, the Liverpudlians John Sadler and Guy Green filed for a patent for the process of printing on tiles, claiming that within six hours, they could print upwards of twelve hundred earthenware tiles with various patterns more neatly than one hundred skilled painters. To create a transfer print, designs were hand etched onto copper plates, which were then covered with an oil-based pigment. The image was transferred onto thick tissue paper using a printing press. The paper could then be positioned onto a tile (or other ceramic form) and fired in a kiln. This process revolutionized ceramic decoration. Previously, objects were painted by hand, a task which was not only laborious but expensive for factory owners; talented factory decorators were highly paid for their artistic work. Transfer printing allowed for a high quality image while cutting production costs and massively increasing productivity. The use of transfer printing was part of a broader trend of industrialization and standardization in ceramic production during the eighteenth century. Figure 1. Elisha Kirkall, Fable 82, The Lion and the Frog. Reproduced from Aesop, and Samuel Croxall. Fables of Aesop and Others: Translated into English by Samuel Croxall, the Tenth Edition, Carefully Revised, and Improved. London: W. Strahan, 1777. Story adapted by the author.